A branch of the First Baptist Church in Westerly was organized here, in what was then called Lottery Village, on the 7th of February, 1843. 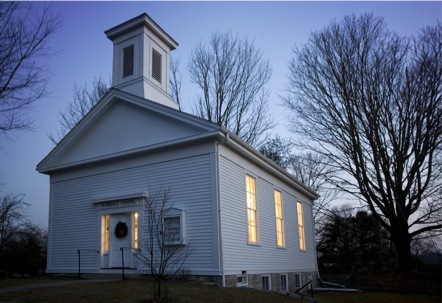 The earliest meetings of the church were held in the local schoolhouse. In 1847, fifty-seven subscribers committed to erecting a House of Worship at this site on land donated by one of the subscribers, “Brother” Ethan Pendleton. According to records, the cost of that first building was $1,200 culminating with a Dedication of the House on October 28, 1847. In the summer of 1859, the 'Branch' church became an independent body with thirty-three members, led by the first pastor, Rev. Nicholas H. Matteson, who was himself ordained in the fall of 1849. The first meetinghouse was destroyed by fire in February of 1852, but by then the members were truly united in their common covenant, taking only until December 30th of the same year to erect the building virtually as you see it today. Three years later, on the 1st of December, the church, being without a pastor, returned to the “watchcare” of the Parent Church from which it had sprung. Over the years, membership rose and waned as a gentle ground swell, with the most memorable activity being a Sunday School sponsored by the Avondale Mothers’ Club. Many adults here still remember the good times at the Avondale Chapel. The Avondale Chapel is now an outreach of The Central Baptist Church. It was restored for services in 1989 and continues to be used for ecumenical worship to this day. View our chapel restoration photo gallery.